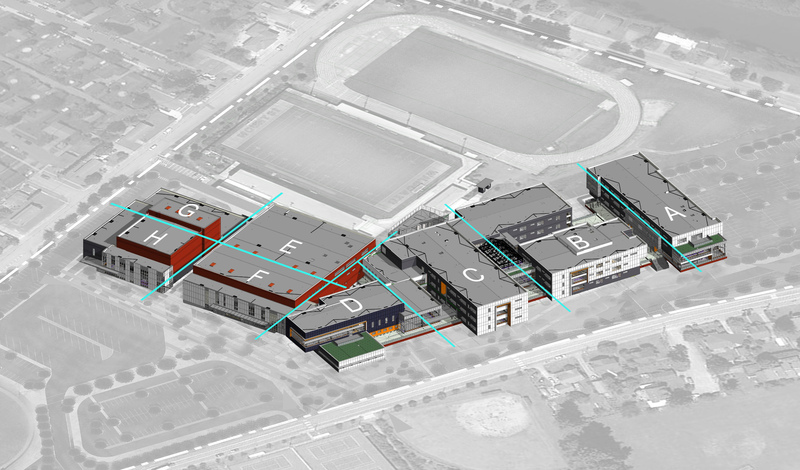 Work continues on the Phase 1 portion of Mount Si High School (MSHS) construction, which is identified as areas A through F (see rendering below for reference) . 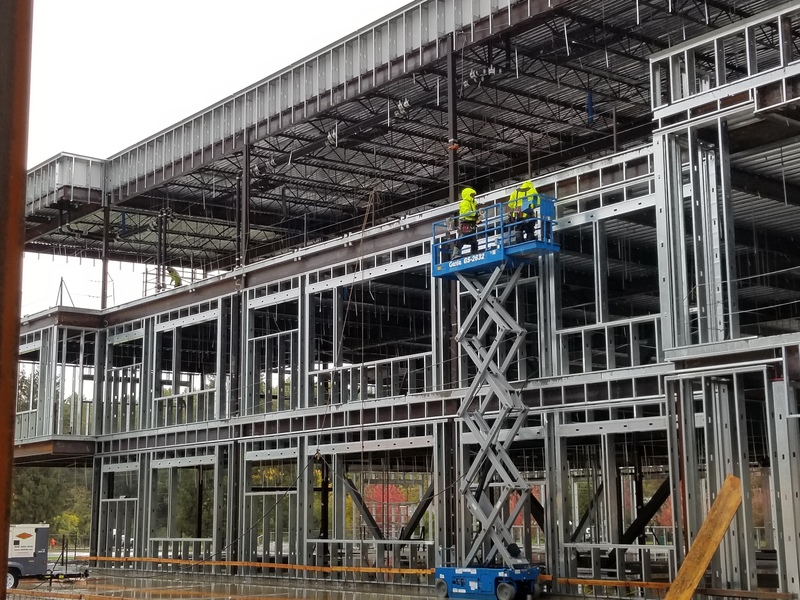 With the building beginning to take shape, student and staff excitement for the opening in 2019 is growing. In areas A and B, the structural steel frame, steel decking, and steel stud roof parapet walls have been completed. 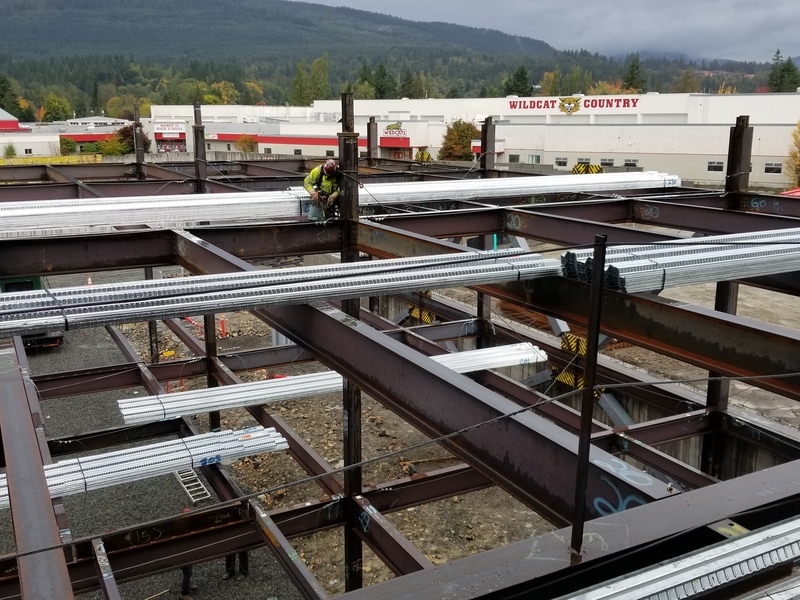 Work continues on concrete slab pours, steel stud wall layout and installation, as well as the mechanical, electrical and plumbing rough-ins. The north parking lot, adjacent to Area A (the Freshman Campus), is also being developed. 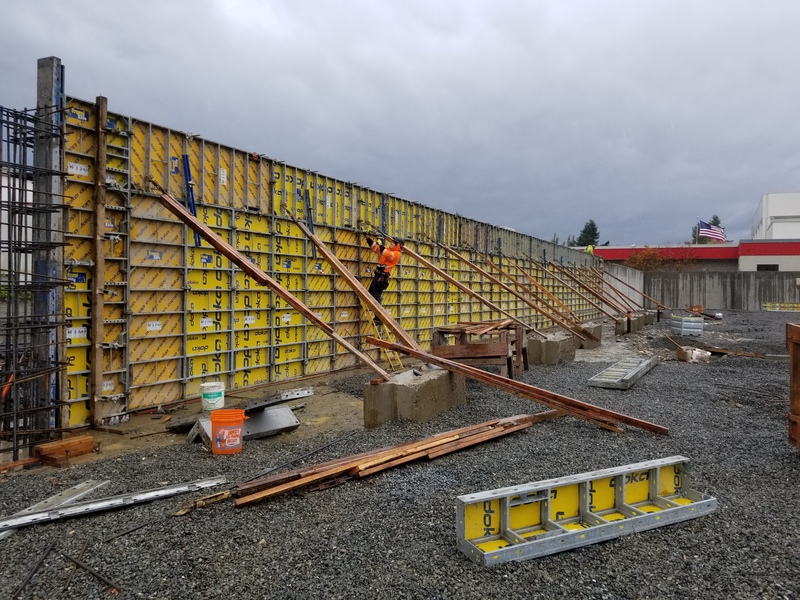 With the concrete footings and foundations now completed in areas C, D, E and F, and the last retaining wall in Area D nearing completion, those areas are also ready for steel framing. Last week, steel workers began that work, which is anticipated to continue through December. Top left: Last retaining wall nearing completion. 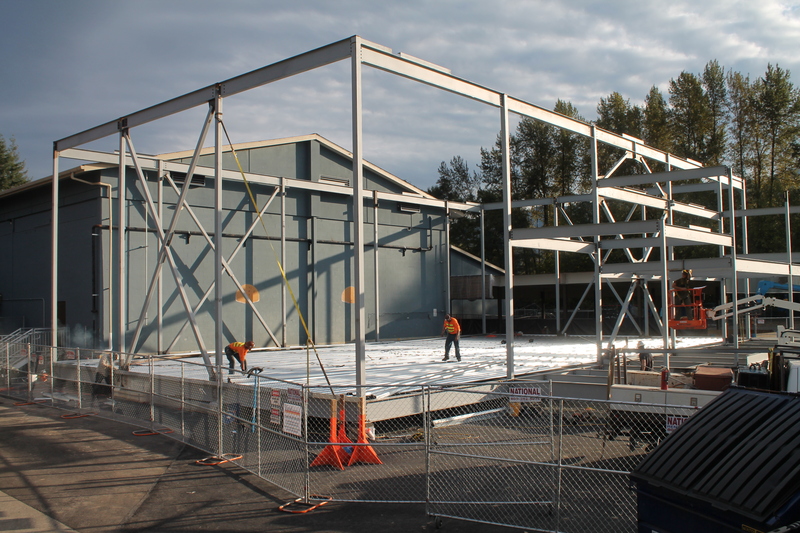 Top right: Installing steel frame to Area C. Bottom left: Corrugated steel is added to Area B, onto which concrete will be poured for the floors. Bottom right: Steel stud wall work on Area A. For several new photos and additional details about the MSHS construction, read the October 2017 Status Report from the Project Manager. 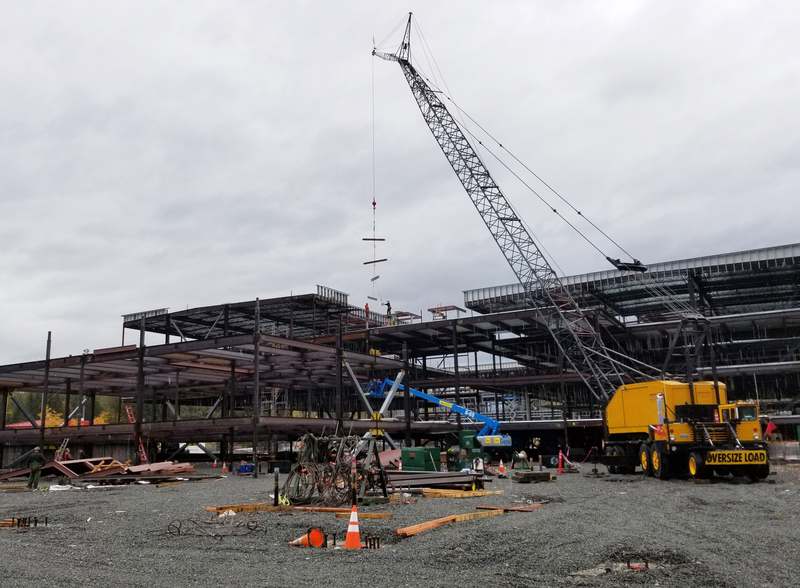 Construction on the Snoqualmie Elementary School (SES) gymnasium also reached an important milestone, with structural steel work under way. The addition of this space is a significant improvement for SES, bringing it on par with other elementary school facilities in the District. at Snoqualmie Elementary School is quickly taking shape.